A Sales Order is a document sent to your customers confirming the items and prices of a sale. A sales order is usually created after a quote is accepted by your customers and your items are ready to be shipped or delivered to your customers. Create a sales order which details the items that you are going to sell to your customers and their prices. Save it as a Draft. Once the sales order is confirmed, convert it to Open. 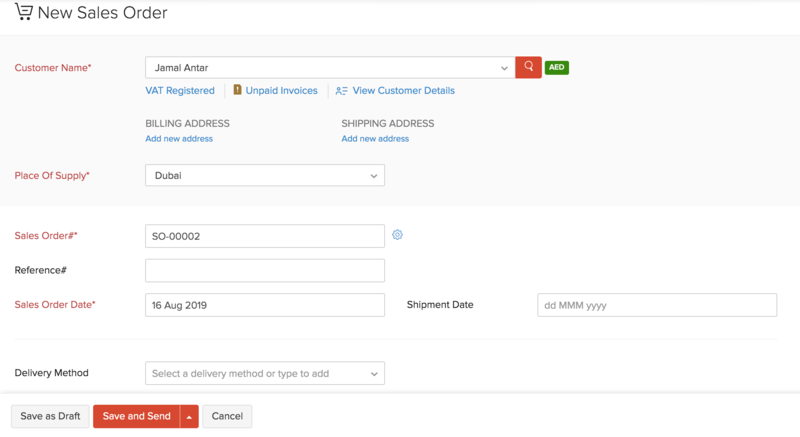 Convert the sales order into an Invoice and send it to your customer. If you have low stock of your items, you can convert your sales order to a Purchase Order. Go to Settings > Preferences > General. Ensure that the Sales Orders box is marked. Go to Sales > Sales Orders. Click the + New button in the top right corner of the page. Fill in the customer and item details, shipment date and any other fields which will be applicable for your sales order. Click Save as Draft to create a draft or Save and Send to send it to your customer’s email address right away. 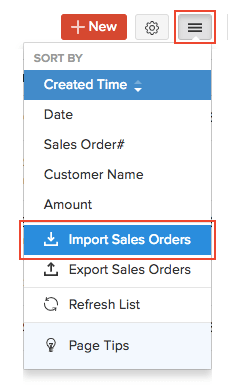 If you have saved your sales order as a Draft, you can convert it to the Open status to ensure that the sales order is active and shows up in your sales reports. Select the sales order (in the Draft status) which you want to convert to open. Click Convert to Open in the top right side of the page. Click the Hamburger icon in the top right corner of the page. Click the Choose File button under Upload File. You can download a sample CSV or XLS file for your reference by clicking sample file. Choose the Character Encoding and File Delimiter for your file. 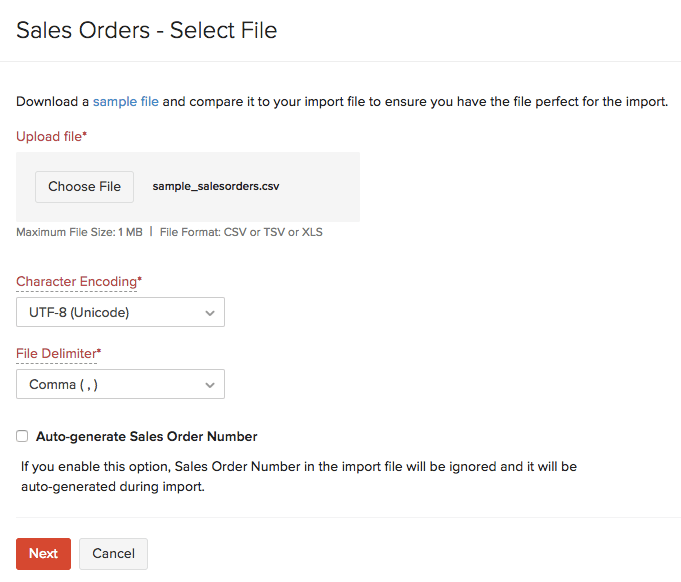 If you want your sales order number in the imported file to be auto-generated, mark the box Auto-generate Sales Order Number. Ensure that all the fields are mapped correctly in the Map Fields page. Mark the box Save these selections for use during future imports if you want to use the similar import format for the next time. Do you want to convert an estimate to a sales order? 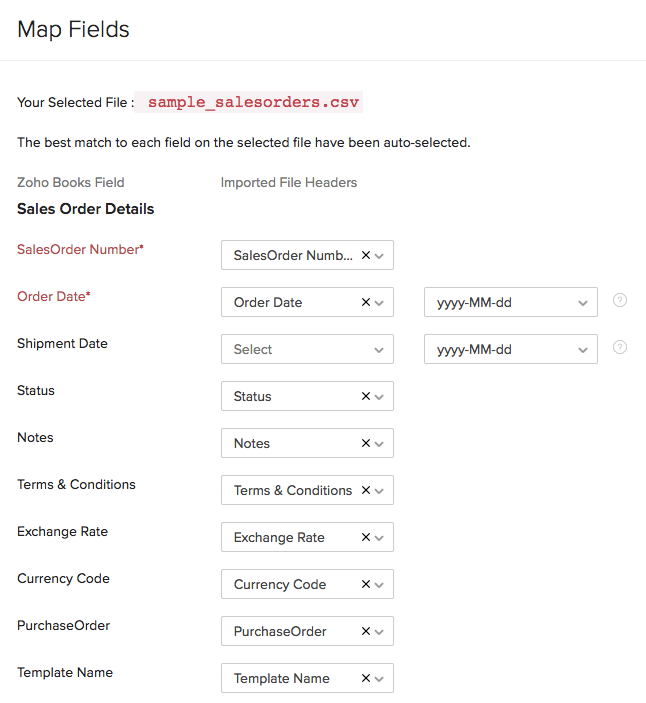 In Zoho Books, you the option to convert an estimate which is in the Accepted status directly to a sales order. Let’s say you have created an estimate or a quote for your customer. Once your customer accepts the estimate, you might want to convert it into a sales order confirming the items to be sold, the delivery method and other necessary details. Go to Sales > Estimates. Select an estimate which you want to convert into a sales order. Click More > Convert to Sales Order. The New Sales Order page will be auto-populated. Verify the details, and save and send it to your customer.